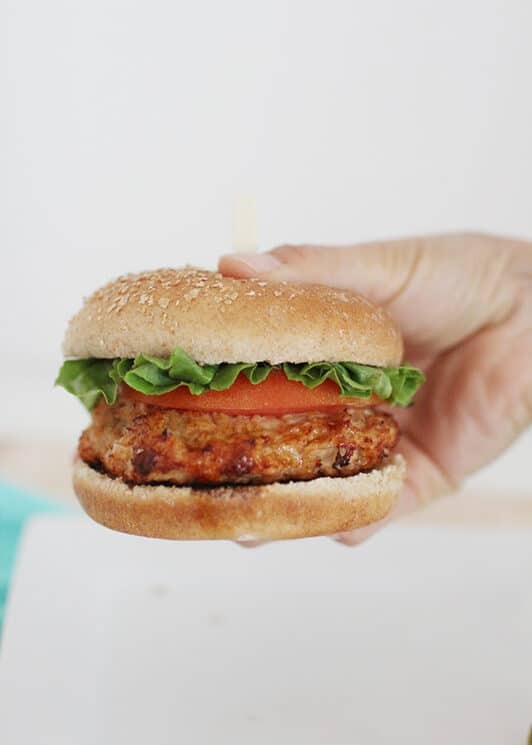 Delicious twist on a classic burger, but healthier, juicier and tastier! 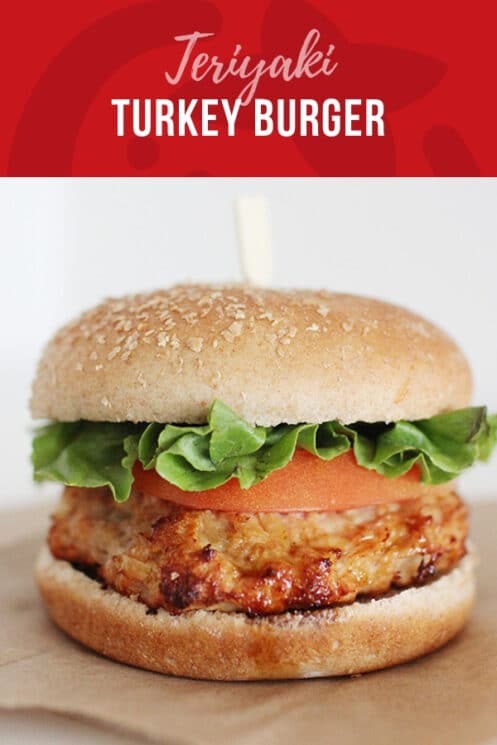 The Teriyaki Turkey Burger! 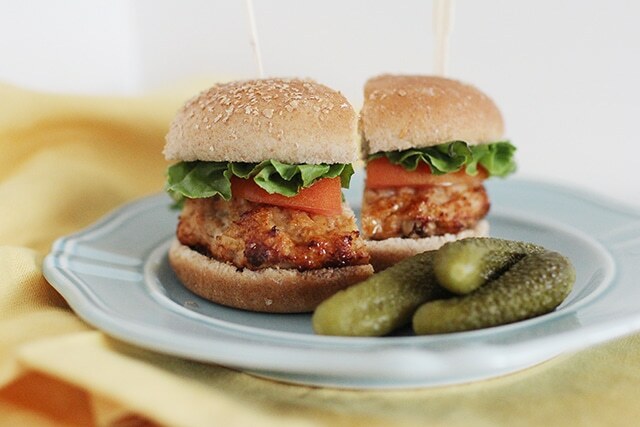 We created these teriyaki turkey burgers a little different than you would expect. 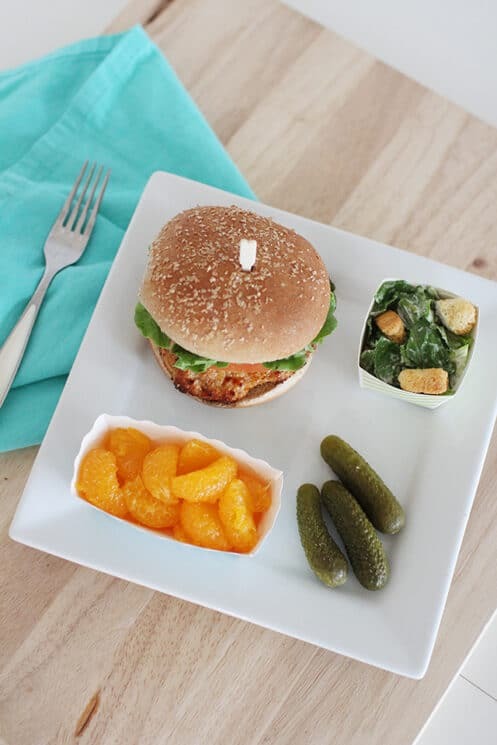 We added chestnuts for a little crunch, and couldn’t believe how much we liked them inside our patties. It for sure made our burgers a little more filing, and provided manganese, molybdenum, copper, and magnesium. They are also a good source of vitamin C as well as vitamins B1, B2, and B6 and folic acid. We used ground turkey, although ground beef also tastes great of course. If your family isn’t sold on ground turkey yet, these burgers are a great place to introduce them. The flavor is definitely different than ground beef, but when you add the teriyaki sauce, that’s the flavor that really comes through, and not the turkey flavor. Is ground turkey healthier than ground beef? While we get this question a lot, it’s sometimes a tough one to answer. Food science is forever evolving and what we decided was unhealthy years ago, may not be as bad as we once thought. With that said, comparing ground beef to ground turkey really isn’t a fair comparison. Depending on where the meat was obtained from the animal, the nutrition content can vary. You can have lean ground beef and full fat ground turkey and the ground beef would be considered healthier. The nutrition profile also changes depending on what the animal is fed. Free range cows, able to graze on grass has healthier meat than an animal under stress that is only fed corn. With that said, it’s a personal choice whether your family will consume ground beef or ground turkey. For our family, I like to have both. 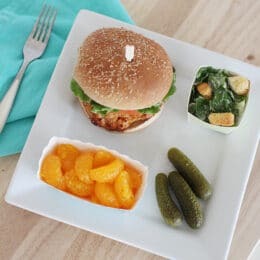 The bigger variety of foods in our diet, the less likely the kids are going to be picky. I like to be able to give them a variety of tastes, flavors, and textures of food to expand their palate. Finely dice the water chestnuts. Toss into a mixing bowl with egg, teriyaki sauce, breadcrumbs, onion powder, salt and ground turkey. Mix together and then shape into 4 burger patties. Preheat and indoor grill or if the weather permits, use the outdoor grill. Cook each burger for 6-8 minutes per side, or until no longer pink in the center. While burgers cook pull off 4 large leaves for the burgers and set aside. Chop the remaining lettuce and put into a bowl with the dressing and croutons. Toss together to fully coat. Serve burgers on buns topped with sliced tomatoes, lettuce leaves and condiments of choice. Hi Amy, we love turkey burgers over here too! Hi, do you use canned water chestnuts?